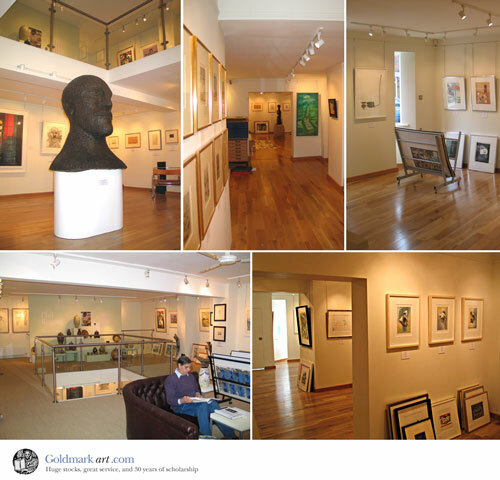 Goldmark Gallery has been selling 20th century and contemporary art for nearly two decades. We are dedicated shopkeepers, open all year round, seven days a week. Our gallery is situated in Rutland in the tiny market town of Uppingham. We have always felt that scholarship was important and to this end have published over 30 catalogues. We have now turned to filmmaking and are just finishing our third art film documentary. We are also Britain's most occasional publishers, publishing works that we believe to be important but maybe not commercial (It was us who hired the Albert Hall in 1995 to launch a poetry book). We have been selling mail-order for some time now and are well used to working in this way. There are fourteen of us here and we are more than happy to chat with you on the phone.